These bricks are also known as the hot face and cold face insulation bricks. 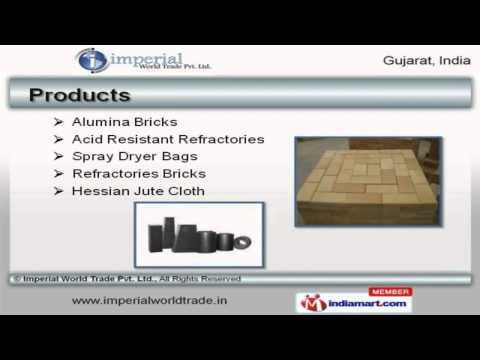 These bricks are an essential component in many industries which involves high temperature. To provide highly effective heat insulation, these bricks possess low heat storage and low thermal conductivity. Even in the worst temperature conditions that are higher than 1000 degree Celsius, if these bricks are placed in such application areas, these don't get affected due to its high heat and pressure resistance. Imperial world trade is well-renowned name as CF/ HF insulation bricks manufacturers. We are HF/ CF insulation bricks suppliers as well as HF/ CF insulation bricks exporters. These insulation bricks are made from various types of raw materials which include kyanite powder, insulation grock, rice husk, raw dust, ball clay and China clay. Its application area is mainly industries like aluminum plants, steel plants, oil refineries and glass plants, etc. We are HF / CF insulation bricks manufacturers, suppliers and exporters; providing insulation bricks made by us withstand temperature to highest of 1100 degree Celsius as it’s highly temperature resistant. It is very easy to install these insulation bricks. These bricks are used for ceramic kilns, boilers, periodic kilns, heating furnaces, high-efficiency incinerators and glass kilns, etc. Our cold face insulation bricks are highly usable for applications where no or very less thermal and electrical degradation is required. These insulation bricks are made considering very high global standards. These insulation bricks are resistance to high temperature. These insulation bricks are resistant to very high voltage also; as it can withstand the higher voltage shock resistance. The materials used in these bricks are resistant to voltage and these bricks are very high in quality according to global standards. Therefore, it is resistant to very high voltage also. Its resistance power to shock, high voltage and higher temperature make it higher in tensile strength; as these are used in many major industrial plants. Its tensile strength must be higher. These bricks are resistant to shock, high voltage, and high temperature. Therefore, it has very efficient performance. As these bricks are made up to the global quality standards. Thus, these are very durable and long lasting while using for industrial use. These bricks are chemical composition of different elements and as these are made according to the global standards, therefore, these are made up of using high-grade material. Thus, it is high in quality. We are foremost CF/ HF insulation bricks manufacturers; HF/ CF insulation bricks suppliers as well as HF/ CF insulation bricks exporters.